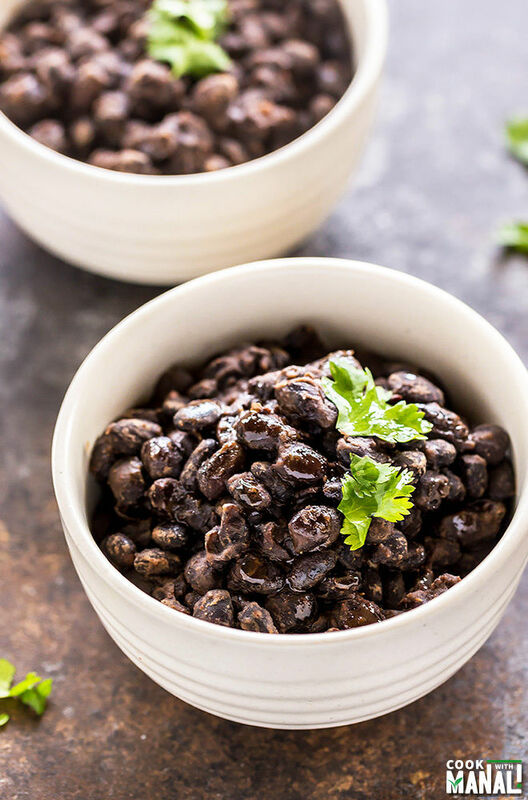 Instant Pot Black Beans – make easy black beans at home using your instant pot. 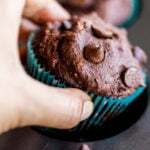 Vegan, gluten-free and you don’t even need to use a drop of oil to make these! 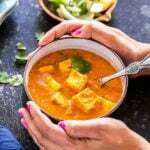 If you love all the Instant Pot vegetarian/vegan recipes that I share on the blog, please join me on this Facebook Group – Instant Pot Vegetarian Recipes. 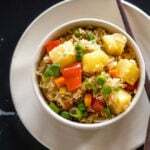 The group would feature vegetarian instant pot recipes from all around the web! Disclosure: This post contains affiliate links. For more information on my Affiliate and Advertising Policy, please click here. My instant pot works overtime these days. I already had a 8 Quart Instant Pot Duo and recently they launched this cute 3 Quart Mini and of course I had to get that too. Yep, 2 instant pot for a family of 2, you can say food bloggers are a bit crazy that way! I feel like cooking all the time in my IP these days and I can’t even remember the last time I used my regular pressure cooker. Even though I have always cooked in pressure cooker (like every other Indian! ), it was bit of a learning curve when I started using the IP. With our regular pressure cooker, we usually rely on “number of whistles” or guess work to determine if the particular lentil/beans was cooked or not. With IP, it’s pretty precise and there are separate buttons for everything, plus there’s no whistle sound! Well that’s what makes it such a cool gadget to have in your kitchen. These black beans can’t be easier to make. You only have to dump everything in the inner pot of your IP and then forget about it. And in the mean time you can do the other prep work for your meal, like making rice or making salsa! This is why I love IP, I don’t have to keep checking it all the time, saves so much time. 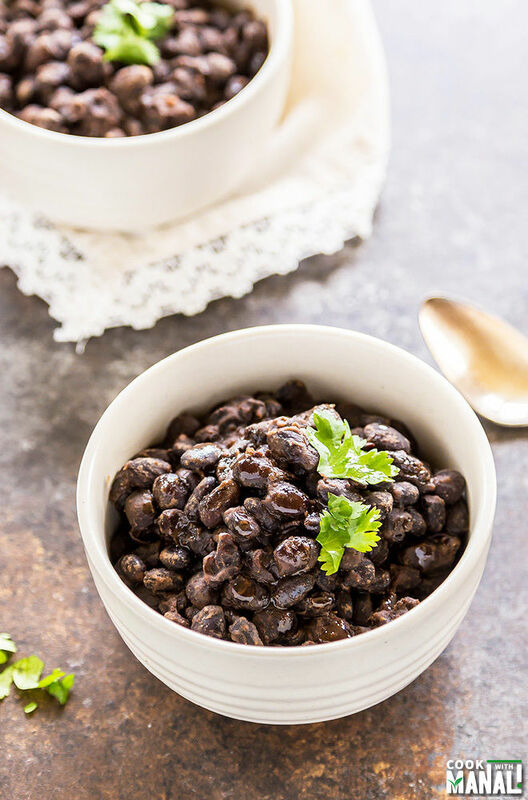 For these instant pot black beans, I used little garlic, onion, cumin powder, oregano and smoked paprika. I also added a bit of chipotle powder for that kick, you may skip it. The amount of water that you would need for these beans would depend of how saucy you like your black beans. So you have 2 options – it’s great either way! I added 2 cups water for 1 cup of dry beans. When I opened the IP, it seemed like a little more water than I would have liked. So, I pressed the “saute” button and let it simmer for 2-3 minutes till it reached my desired consistency. The water dries up pretty fast. If you want very little water in your beans, go with 1.5 cups water. Keep in mind though, beans will soak water and become more drier with time. I soaked the beans in hot water for 1 hour prior to cooking them and cooked in the IP for 20 minutes on bean/chili mode (which is high pressure). If you don’t soak them, you might want to cook them for 30 minutes on high pressure. 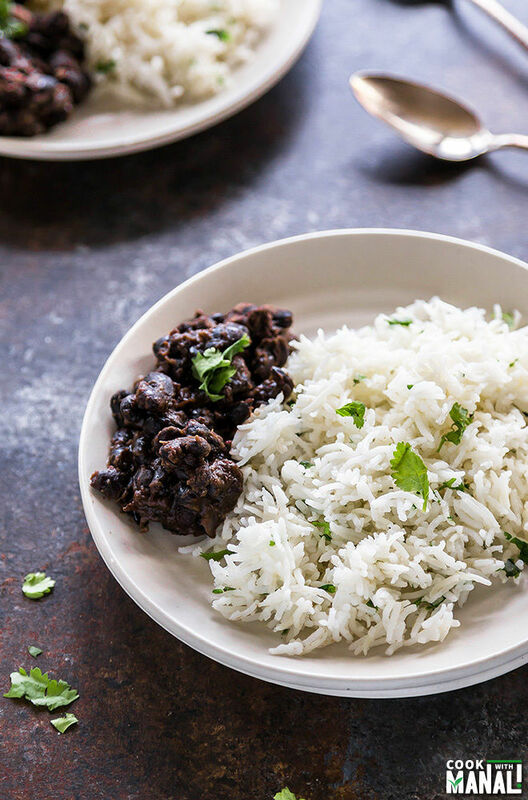 Soak the raw black beans in hot water for 1 hour. Rinse the beans and drain the water. To the inner pot of the IP, add the drained black beans along with a bay leaf, sliced onion and chopped garlic. Add cumin powder, dried oregano, smoked paprika and chipotle powder. Add in water, salt and stir to combine. Close the lid of the IP, set valve to sealing position. Press the “Bean/Chili” button and using the “+” and “-“, adjust the time to 20 minutes [or you can do manual high pressure for 20 minutes]. The IP will come to pressure and then count 20 minutes. When 20 miuntes are up, you would hear a beep. From this point, wait for 12 minutes and then release the remaining pressure manually. The middle picture shows how my black beans looked liked when I opened the IP. If they look too watery/saucy for your taste at this point, press the saute button (I did that) and let it simmer for 2-3 minutes. As you can see in the 3rd picture, the water dried up pretty quickly. Sprinkle additional chipotle powder (optional), adjust salt to taste and dig right in! * Cook the beans for 30 minutes on high pressure if you don’t soak them. I recommend soaking them though, it’s just better for digestion. * The onion and garlic dissolve with the beans by the time they are done. * Adjust spice levels to taste. * The actual cook time would be more than 20 minutes since the IP takes time to come to pressure and then you have to wait for some time before releasing the pressure. 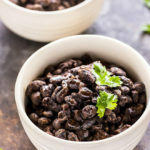 Black Beans made in the Instant Pot. So easy, vegan, gluten-free & made without a drop of oil! 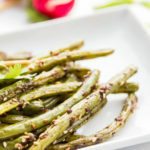 Eat it with rice or add to salads or burritos! 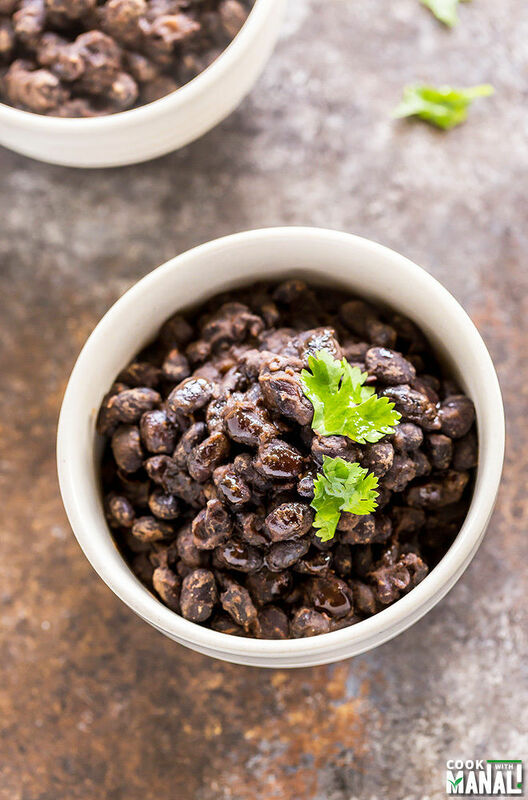 Soak the raw black beans in hot water for 1 hour. Rinse the beans and drain the water. To the inner pot of the IP, add the drained black beans along with a bay leaf, sliced onion and chopped garlic. Add cumin powder, dried oregano, smoked paprika and chipotle powder. Add in water, salt and stir to combine. Close the lid of the IP, set valve to sealing position. Press the "Bean/Chili" button and using the "+" and "-", adjust the time to 20 minutes [or you can do manual high pressure for 20 minutes]. From this point, wait for 12 minutes and then release the remaining pressure manually. Open the IP, if beans are too "saucy/watery" for your taste at this point, press the saute button and let it simmer for 2-3 minutes. 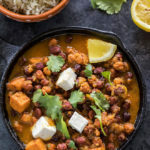 I’ve been debating about whether I should get an instant pot or not, so I think I need to after seeing this recipe. Looks delicious, Manali! I love that you didn’t use any oil in here! Yes you should! it’s really a cool gadget! Really? 2 instant pots??? 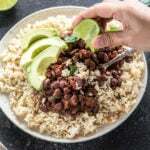 I wonder how big is your kitchen…mine is small and overloaded…the black beans look great! 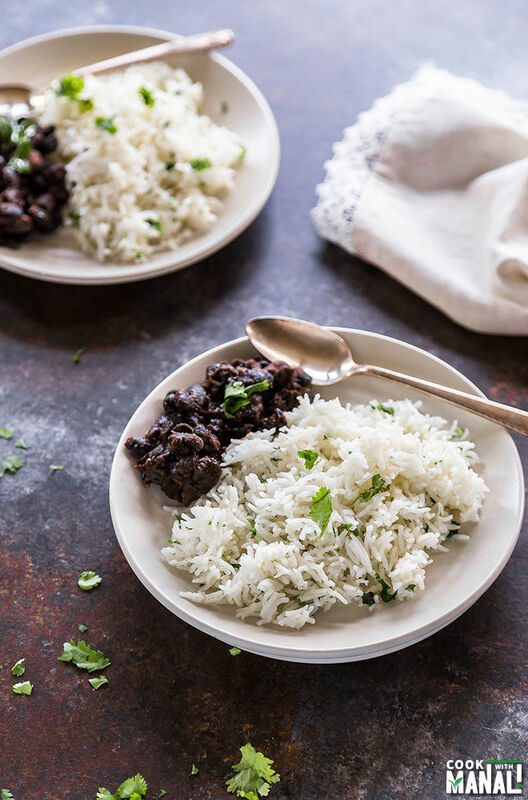 I love black beans and these look perfectly cooked! I’ve only used my instant pot twice, but can’t wait to use it again! My God, This looks so yummy & amazing. 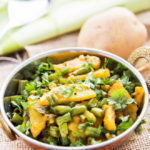 As I’m vegan so I can’t wait for this to make and eat this super yummy dish with my family. 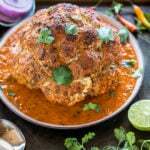 Looking forward to more recipes, Thanks for sharing this with us. Best wishes and Regards. This recipe worked perfectly! Especially the tip about sautéing the bean to reduce a little more water! Definitely a recipe I will use forever! !